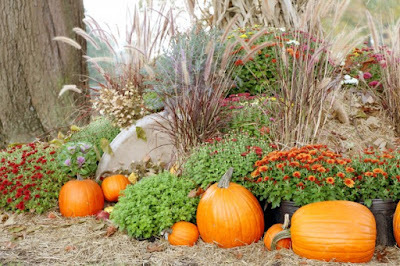 Pumpkins can be used for decoration or can be used to create wonderful pumpkin soups or desserts. The best way I have found to serve pumpkin soup is to bake up some bread molded over up-side-down oven-proof bowls as the 'pan' and making soup bowls out of them. Delicious and an attractive presentation, too. You can get a great bread soup bowl recipe at Allrecipes.com. of pumpkin over an open fire. Traditionally, most people think of cooking with pumpkin in the fall season, probably because that is when pumpkins come to market, but you can cook with pumpkin year round--just use canned pumpkin puree. Pumpkin is full of beta-carotene, an important antioxidant. A plant carotenoid, beta-carotene is converted to vitamin A in the body, enhancing overall health. Beta-carotene may also reduce the risk of heart disease and come types of cancers, as well as protecting against eye disease. In colonial times, the colonists removed the pumpkin tops, scooped out the seeds and filled the insides with a combination of milk, spices and honey, which was then baked in hot ashes. The pumpkin pie came from this humble beginning. Native Americans also ate pumpkins. They roasted long strips of pumpkin over an open fire, and also used pumpkin seeds for food. Today, pumpkin seeds can be purchased in most grocery stores throughout the year. Have you ever cooked a pumpkin?